I was looking for a product that would help with frizz and fly away strands of my hair. I am pretty conservative and do not like to spend a lot of money on hair products, so I tried this. It was not the best, yet not the worst either. 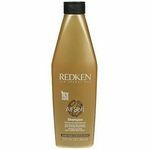 It did make my hair feel very soft and manageable, but I didn't see any results on my hair being sleek and smooth. It did not help with the frizz at all, my hair looked the same. This was more of just an everyday shampoo than something that is suppose to help with frizz. Effectiveness This shampoo lathered up well and my hair felt very clean, but I did not see any results with my hair looking less frizzy or dry. I needed a conditioner after using this product. I thought since it was more of a sleek shampoo that it may make my hair too heavy looking if I used a conditioner as well, but it did not. My hair felt dry without the conditioner. Scent The scent was nice, and made my hair smell very good. It was stronger than most shampoos which I like. 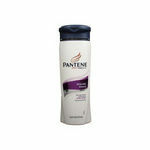 I have really frizzy, long hair, so I try to use shampoos that help straiten my hair whenever possible. One that works pretty well on my hair is the Suave Professionals Sleek Shampoo. I typically use only a small amount of this shampoo on my hair. It lathers really nicely, and it leaves my hair feeling clean. I don't have to worry about my hair getting oily or dry when I use this shampoo. It seems to really moisturize my hair which helps with the frizziness and fly-aways. This shampoo also has a great scent. It leaves my hair smelling clean throughout the day. Since I have color-treated hair, I also worry about shampoos being too harsh on my hair. I don't have to worry about that with Suave Professionals Sleek Shampoo. It doesn't fade my color at all. Effectiveness This does a great job of keeping my hair moisturized so my hair does not get too frizzy throughout the day. Scent This has a great scent that keeps my hair smelling nice all day long. Suave Professionals Sleek Shampoo isn't the best choice for someone who has oily hair, like me. When I used this, I liked the fact that it did make my hair seem more "sleek" and smooth, but that sleekness also didn't last long enough because my hair would get oily too fast after just a day. I usually wash my hair every other day, so when a shampoo doesn't let me last that long I won't keep using it. Unlike other Suave shampoos, this one doesn't keep your hair from getting oily too fast because it does a probably better job at moisturizing your hair and helping control frizz. Unfortunately, this isn't suited to my hair. If you have drier, damaged, or curly hair, this might be a good choice for you. But if you're younger and still have to deal with oily hair, find another shampoo! Or, be prepared to wash your hair every single day in order to keep yourself looking sharp and presentable. I have had this particular styling product for a few years now, and although I am a suave fan, I really felt like this product was just ok. The product is supposed to help keep the frizz in your hair on the downlo and while it does do that a little bit it really did not work that well on my hair. It could have no worked because of my super thick hair. However, it came in great packaging. Effectiveness This product really did not do what is was supposed to in the way of helping me get frizz to stay out of my hair. Now this could very well be because I have extremely thick hair, and a lot of it, or it could just be because the product does not work that well. I do not know, maybe I just did not use enough of it. Scent When thinking about the scent of this styling product, I do not think that it really had a distinct smell to it which is not necessarily a bad thing, especially when most people wear perfume or other scented products as it is. In my experience, there's nothing remarkable about this shampoo--good or bad. It is quite honestly the most ordinary shampoo I've ever used on my hair. I thought that a shampoo formulated especially for dry and/or frizzy hair would be creamy and moisturizing. However, Suave Professional Sleek is better suited for amateur hour, in my opinion. The scent is blah, the consistency of the shampoo was a little thin, and the lather is neither rich nor stimulating. Effectiveness Most importantly, the results were simply average. My hair felt reasonably clean and reasonably detangled, but nothing close to professionally sleek and optimally moisturized. I would recommend it only as an inexpensive product to have on hand if you're looking for a no-frills shampoo. However, if you're expecting a salon-level shampooing experience you're probably going to be disappointed. Scent Really, what little scent there is in this shampoo isn't memorable in the least. It was sort of ho-hum. On the plus side, it won't interfere with your cologne or other fragrance. Transformed My Hair Into A Tangled-Mess! I have yet to find the perfect shampoo for my hair. Until then, I've been using this 32oz bottle of "Suave Professionals Shampoo, Sleek, For Dry or Frizzy Hair." This moisturizing shampoo, that's enriched with a silk protein & vitamin E complex, is supposed to transform dry or frizzy hair into a healthy looking salon smooth style. After using this shampoo, my hair was supoosed to be up to 7X smoother! Ummm, that didn't happen in my case. My hair felt/looked clean and it smelled good but I was left with tangles that were in need of alot of conditioner! I'll be shopping for a new brand after this bottle runs out. I won't be recommending this to any friend! Simply divine.. smells heavenly and makes your hair soft to touch. I have thick coarse hair, not to mention lot of it though it is only chin lenght. Curiously i picke up this shampoo coz i had the coupon for it.. and then the conditioner. 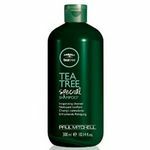 The first use itself i could feel the difference.. the hair was clean but not the squeakiness left by other shampoos of the same brand.The fragrance is not over powering and actually stays in your hair for a few days. The conditioner application makes it so soft and touchable and my hair felt bouncy and shiny. I think i have found my to-go shampoo conditioner shampoo which is not jsut comparable but better than its pricier deppt store and salon counterparts. A must try even if you have curly hair. and definitely can't beat the price. I got mine (shampoo+ conditioner) on sale for less than the price of a coffee. 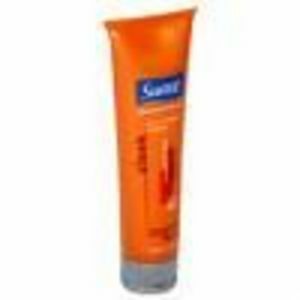 Suave Professional Sleek Shampoo. Bargain-Friendly Results! The hair care (shampoo/conditioner) aisle of any major supermarket is jam-packed with options. From expensive SOUNDING products to products which are downright just expensive. Suave products tend to be in the bottom third of the price range and in the past, I have found the performance of their products to be within that range, too. NOT SO with Suave Professional Sleek Shampoo. I have thick, naturally wavy hair and I love this shampoo, especially in combination with Suave Professional Sleek Conditioner. 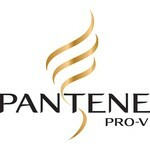 The product delivers on its promises -- smooth, sleek, shiny hair EVERYTIME! It is not a miracle-in-a-bottle, so don't expect pin-straight hair immediately upon exiting the shower, but I have found the moisturizing elements of this shampoo to be above average. I like the smell and I love the price. If you are looking for a budget-friendly hair care (shampoo) option, look no further than Suave Professional Sleek Shampoo! Ok, so I have frizzy hari, very long and frizzy hair. I have used a lot of products on my hair to try and get it to a managable point. But after a long time, those products get pricey. And since I've become being a stay-at-home mom, I can't afford the samethings anymore. So after becoming intresed in the new sauve professionals product line, I decided to try it. The shampoo and conditioner was in my opinion cheap enough. The first time I used it, I thougt it was awesome. The shampoo and conditoner smelled great. The shampoo was a nice and thick, the conditioner however wasnt, so I really didnt think it would work. But I tried it anywasy, I bought it. Its isnt as think as pantene is, but it worked. My hair came clean and felt great. But after it dried was the real test. I did not style my hair as I normally do, I just left it to air-dry. And to my surprise my hair was smooth and shiny. Just after one wash!! I am very pleased with the new sauve product line. This is going to same me money and time. No more do I have to add other products to my frizzy hair to keep it looking great through out the day.